This project assesses the feasibility and demand for a cooperatively owned, federally licensed and woman-farmer led mobile slaughtering unit and/or retail butcher establishment in South Central Wisconsin, primarily servicing the counties of Green, Lafayette and Iowa. This project addresses two key problems: lack of local meat processors in southern Wisconsin in addition to amplifying representation of women in the meat industry. In the tri-county area in Southern Wisconsin (Lafayette, Iowa & Green Counties), there are only four state inspected facilities; however, there remains increasing unmet demand from area farmers for meat processing, especially a facility specializing in no stress kill, organic and artisan-cured meats. The current facilities available are only Wisconsin licensed and have long waiting times. Furthermore, the majority of state facilities trim recipes include ingredients that contradict the quality and integrity of the meat, such as adding MSG and high fructose corn syrup. With our close proximity to Illinois and Iowa markets, many of the local producers are forced to use federal USDA facilities located long distances from their farm. Over twenty area farms have expressed interest in potentially using such a facility; however, due to the scale of such a potential project, our local community has not been able to bring it to the next level of strategic planning, which this grant would wonderfully be able to support. Additionally, this project provides learning and insight into how to increase the role women play in the meat industry. While women farmers are increasing in number at over 20 percent in the last 20 years, we still remain significantly underrepresented in the meat industry, male-led professions: male ranchers account for 97% of all US livestock sales (2012 census). This statistic manifests itself locally with no female leadership in the current meat processing facilities. We see the need for improved networks, training, and support to get women involved. Through engaged research (including on-site visits of existing facilities), facilitated community focus groups and discussion and meetings with various state and federal regulatory officials, we will establish the foundation for a business plan and funding sources as well as provide a template and insights for other communities that have a need for increased local processors. Additionally, we will dial into the financial feasibility of such a facility and find additional funding options if the project proves to be feasible. Being uniquely female farmer led, this whole project process will be documented in a detailed case study with various outreach materials (articles, workshop, etc.) to help support other female farmers in similar situations. Gender barriers will have the forum for discussion and collaborative solutions which will then via these outreach materials help inspire and guide other women to take leadership roles in meat processing. In order for more women to engage in the meat processing industry, we need to see increased role models to aspire to. Through the documentation of both the successes and challenges of this project, this project will achieve exactly that. Assess the feasibility and demand for a cooperatively owned, federally licensed (or a reciprocity agreement) and woman-farmer led mobile slaughtering unit and/or retail butcher establishment in South Central Wisconsin, primarily servicing the counties of Green, Lafayette and Iowa. Benefit the environment by growing local meat production, which decreases the amount of fuel used to transport product and encourages practices these farmers are known to use including: using local feed sources that are traceable, pasturing, organic production, and spreading manure over large areas rather than being concentrated and turned into a negative externality. 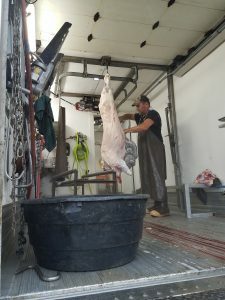 Increase income in the long-term for area farmers by providing additional sales outlets, additional products and opportunities, increasing ease of processing meat and decreasing time spent away from the farm, keeping more money earned in the local economy, and creating local jobs with the mobile slaughtering unit and potential retail facility. Provide social benefits including a model for other regions, preservation of area cultural tradition, customer and farmer education about the local market supply, and a local meat production model that is transparent and ethical throughout the production and labor process. 2017. Prusia visited local grocery stores and interviewed owners: Emberson’s in Blanchardville, Wisconsin and Gempler’s in Monticello; both have active meat counters and with aged out butcher facilities on site. December 2017. 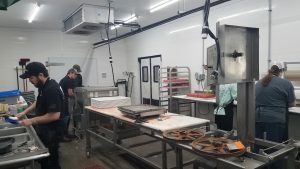 Visiting butcher facilities: Prusia volunteered at Prem Meats, in Spring Green, a butcher facility to gain an inside look and understanding of their story. Prem Meats is a new state facility that works with a Mobile slaughter unit, Natural Harvest. They do not presently have a kill site. She came to understand the process of breaking down animals, as well as the physical and mental demands of butchers at their facility. Also she recognized the volume of animal waste produced in a days work. She was able to see different equipment in use and further understand what is needed for a fully functioning facility , such as vacuum sealers, scales, labeling, rail system, band saw, refrigeration, water and efficient layout . September 2018. Storm contacted Green , Lafayette and Iowa county Zoning regarding current regulations, ordinances and zoning requirements on butcher facilities. October 2018. We developed a survey using Survey Monkey and distributed hard copies with self addressed envelopes. The goal of the survey is to assess the feasibility and demand for an additional brick and mortar butcher facility and mobile slaughter unit (MSU) to service farmers in south central Wisconsin. The survey has been dispersed at farm events, farmer’s markets, farm related Facebook groups, through Ag extension agent contact lists, County Land and Water Conservation departments and farm list serves. We took care to not exclude any sized local farm. As of 12/13/18 forty surveys have been received, getting us nearly halfway to our goal 100 surveys. We will be collecting surveys until January 2019. Evaluating the butcher needs of existing farmers through conversations at farm events, online farm list serves, and Facebook farm chat groups. Prusia joined Niche Meat Processor Assistant Network (NMPAN), an amazing niche meat processing list serve, and has had real time discussions online with others in the industry around the country. November 2018. Prusia, Storm and Anderson attended Woman Food Ag and Network (WFAN) conference in Des Moines, Iowa. Their employees are their first customers-They realize keeping employees happy keeps the facility running. December 2018. Meet with Driftless Poultry Processing Cooperative to discuss the possibility of pooling resources and building a facility that serves both the poultry producers and large animal producers in Southwestern Wisconsin. Information about HACCP (hazard analysis and critical control points) what are the costs, how long does it take to write, etc. What does it take to license a new facility? How long does it take? What is the process/timeline? How does reciprocity work between Wisconsin and bordering states? What is the certification necessary to carry reciprocity? What is the jurisdiction of the State Inspectors? How many inspectors are in the state and what is the demand on their time? Are there barriers with MSU and state inspected licensing and or reciprocity licensing? What are the current education programs for meat processors? What are the current trends in the meat industry? August 2019. Host discussion of results with farmers at In Her Boots workshop in Brodhead, Wisconsin. Explore existing value added facilities: Underground Meats Charcuterie and Conscious Carnivore in Madison, Wisconsin.